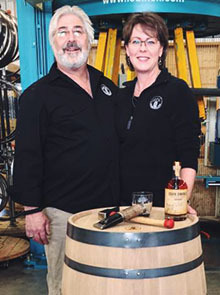 Adirondack Barrel Cooperage, LLC, owned and operated by Joseph & Kelly Blazosky in Remsen, is one of only three cooperages in New York State. The work of a cooperage is the ancient art and craft of making barrels used by wineries and distilleries. At ABC, they artfully blend the precision of high tech European woodworking equipment with skillful hand-craftsmanship to build premium quality White Oak barrels. Adirondack Barrel Cooperage uses revolutionary charring and toasting technology. Extreme accuracy of temperature control allows for low temp toasting, releasing desirable flavor notes unique to each customer needs. Temperature profiles are stored for individual barrels and batches for data analysis, quality control and consistency. Through extensive market research, Kelly and Joe identified an opportunity to serve the fast growing niche of craft breweries, wineries and distilleries in New York State and surrounding areas. By surveying the industries, they quickly realized the support they would have from future customers for this business. The Blazoskys worked with SBDC Business Advisor David Lerman on project costs and projections and a business plan. With the assistance of both the Mohawk Valley SBDC and Mohawk Valley EDGE and banking partners, ABC was able to overcome the hurdles of funding the project, getting custom equipment from Europe and successfully opening for business. ABC had a grand opening and ribbon cutting in May 2016 and is continuing to grow and meet its projections. “We wouldn’t be here today without the help of the SBDC,” says Kelly.